NRF 2019 - Retail's Big Show is the world’s leading annual retail event, which brings more than 37,000 retail professionals together on a single platform for educational and networking opportunities. This event provides TCS a unique chance to forge new partnerships, learn from the leading players and engage with various clients, partners and analysts. 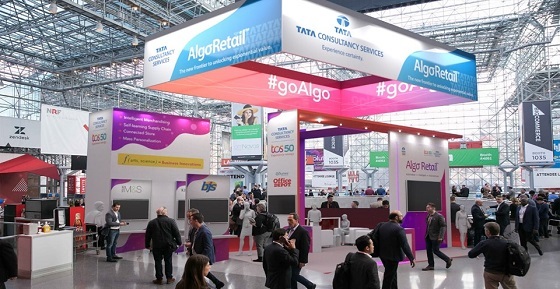 At the event, we will share our perspectives on TCS Algo Retail™ - a paradigm shift in how retailers do business. As we know, retailers have made significant investments in IT that have steadily improved business processes for a number of years — while yielding a tremendous amount of data that has fueled business intelligence and analytics. Now, technologies such as artificial intelligence, machine learning, and the internet of things have become mainstream, and computing power has increased exponentially while dropping in the cost. TCS Algo RetailTM will assist retailers by integrating their business processes with advanced digital technologies, and applying algorithms for harnessing and channelizing the data for driving business success. In addition, various subject matter experts will also be available at the event to provide examples of how merchants can seamlessly integrate and orchestrate data across the retail value chain to unlock exponential value through TCS Algo RetailTM. SupplAI: A first-of-its-kind modelling intelligent SCM solution for forecasting and replenishment through multi-dimensional concurrent optimization, enabling the real time computation of operational planning and execution. Dynamic parameter management, value chain orchestration, replenishment control tower, and a reinforcement-learning hub are additional features of SupplAI. Optumera TM: Merchants can hyper-localize their assortment, space and pricing strategies with the assistance of automated and intelligent decision-making. It enables retailers to work with greater speed & precision while providing real-time modelling capabilities & the ability to consider numerous data parameters. OptumeraTM leverages real-time derived insights to react faster & preempt competitor and fast changing market trends. OmniStore TM: TCS' unified store commerce platform consolidates all shopper data and business logic layers within a unified repository, through a universal cart, breaking barriers between in-store, online, and mobile sales channels. OmniStoreTM uses a bouquet of APIs and micro-services that assists retailers in achieving their unified commerce vision. OmniStore™ is the foundation of a true unified digital customer engagement platform for retailers, through digital interoperability of enterprise capabilities, agile delivery, quick innovations and high flexibility customization without disrupting the core. We will also showcase how our retail customers are using above solutions to gain competitive advantage in the industry (by reducing their costs and increasing operational efficiency). Visit us at Booth #3954 (Main Expo Hall - Level 3) to discuss more.